WILTON -- Behind Trinity United Methodist Church, a small garden planted by parishioners to support the Wilton Food Pantry is harvested and bare - a sign of the oncoming winter. This winter will be the pantry's first, and organizers are projecting increased traffic as the cold sets in and awareness of the pantry, which has steadily grown since it opened in July, rises in the town. "We expect the need to continue to grow, especially as winter comes and the heating bills start to come in," said Jared Dinsmore, president of Wilton Food Pantry. Wilton residents are allowed up to six visits a year to walk with a volunteer through the aisles of the pantry, which is open from 6 to 8 p.m. Wednesdays and from 10 a.m. to noon Saturdays in the back of the church on Ballard Road. They return home with three days worth of food - supplies for nine meals - for each member of the family. The pantry provided food for 37 people in the single week of July that it was open, Dinsmore said. In August, it served 87 people; in September, 103 people; and it is on pace to provide for 126 people in October. "The need is there," Dinsmore said. The organization became a nonprofit with tax-deductible status last week. The shelves are well-stocked - divided into sections for grains, fruits, vegetables and so on - thanks largely to a recent food drive at Wilton-based builder D.A. Collins, where employees collected well more than 400 nonperishable food items. More large-scale donations will be needed to keep the shelves that way in coming months, according to the pantry's leadership. "People's priorities are shifting and our need is growing," said Deb Zellan, the organization's vice president. "We need people to sustain this level of giving if at all possible, because the need is going to rise." The county's larger food pantries have known about the sometimes-dire need for donations since long before Wilton's opened. development coordinator Bo Goliber said. They were entirely out of one item synonymous with feeding the needy: soup. "We were like: ‘What are we going to do?' " she said. An appeal to the organization's email list and a shopping list on Facebook helped put food back on the shelves, Goliber said. But it rarely lasts long. "As fast as it comes, it goes out that quickly," she said. pace to serve 6,300, Goliber said. Another pantry run by the Saratoga County Economic Opportunity Council is giving away about 25 percent to 30 percent more food than it was a year ago, director Julie Hoxsie said. The council's pantry has been providing for about 350 families each month recently, she said, on Mondays, Tuesdays, Wednesdays and Fridays. In addition to food and other items, such as toiletries, that the organization distributes, donations can also be in the form of money, which the pantry can use to buy food from the food bank at a reduced cost, Hoxsie said. 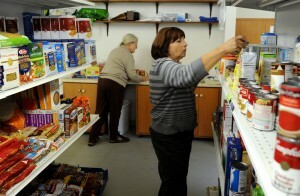 The Wilton Food Pantry hopes to allow for financial donations on its website, wiltonfoodpantry.org, next month. Currently, volunteers can sign up for shifts to accept donations at the pantry or assist those who show up in need of food. During a recent visit, Marilyn Graves and Rose Nesbitt, both of Wilton, mopped floors and cleaned as they awaited another set of volunteers to arrive once doors opened to the public. "We just thought, ‘You know what? That could be me in that line,'" Nesbitt said of her decision to volunteer. Zellan, the pantry's vice president, said the people who come to the pantry range from those struggling with jobs or bills to people who have long relied on some form of assistance to get by. "There's no special identity. You can't look at somebody on the street and know they need food," she said. "You don't know what goes on in their home."